Borovets is the leading ski resort in Bulgaria, attracting thousands of wintersports fans every year thanks to its mix of excellent facilities, stunning slopes and magnificent weather. Without a doubt the best resort in Bulgaria this resort is ideal for beginners, families and those on a budget. The accommodation available across the region is brilliant value, with rooms available to suit every budget. Therefore, whether you’re looking for budget accomodation or a deluxe hotel, there is sure to be options available in this part of the world. Bulgaria continues to be a popular holiday destination for summer and winter breaks, though its ski scene has really taken off in recent years and it’s perfect for those wanting to escape the busy and pricey slopes of France and Switzerland. Based around 12km from the rural town of Samokov and 72km from Sofia, this stunning resort provides majestic views of Bulgaria and has a fantastic atmosphere, welcoming experienced skiers and newcomers alike. With great facilities including luxury hotels, shops, bars and restaurants, there are plenty of amazing attractions to look forward to throughout the resort. The ski lifts are also easily accessible, enabling visitors to travel between slopes with ease. Although Borovets has a large ski area, it is smaller than many of Europe’s busier resorts, making it easy for skiers and snowboarders to get around the numerous slopes across the area. There’s a real family-friendly vibe, too, so it’s perfect for adults and kids alike. The ski season runs from December to April and all of the routes are maintained to provide the best possible surfaces for visitors. The highest lift lets you off at 2560m, which is an altitude capable of competing with some of the higher Western European resorts. Piste grooming has come ahead in leaps and bounds in recent years and the lift system is being improved all the time. As one of the top ski resorts in Bulgaria, there is something for everyone in this magnificent region of Europe. 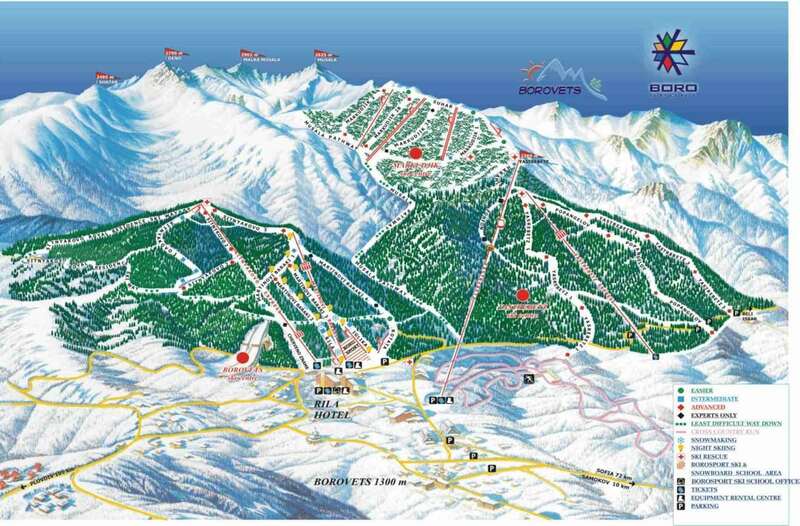 It stands at a height of 1350m with the highest ski run standing at 2560m and the longest run stretching for a total of 12km. The best nursery slopes are available close to the Rila Hotel Complex, including Sitnyakovo 1, which is 5800m in length and boasts straightforward terrain that provides a fantastic introduction to the area. For intermediate visitors, there is plenty of choice, including great runs in the Yastrebets area and the Moussala basin, where there are wonderfully picturesque trails for visitors to enjoy. It’s a great place to develop your skills and improve gradually as a skier, rather than taking risky challenges. When it comes to more experienced visitors, Markujik 2 and 3 are exceptional. These tricky routes attract top athletes to the region year after year. The Yastrebets region also provides some excellent off-piste options. Borovets boasts a wide selection of bars and restaurants, making it a fantastic place for visitors to explore. The Buzz Bar provides a lively atmosphere, while wellness centres, pools and spas are also available to help visitors put their feet up after a tiring day on the slopes. One of the best eateries in the area is Mamacita’s, where visitors can expect amazing food and service, with Mexican dishes available alongside birthday parties, game parties and live music. For Italian food, the Crown Restaurant should be top of your list, serving delicious pizza and pasta while offering magnificent views; it’s easy to see why this eatery remains popular. Away from the slopes, you can take some time to explore the wilderness by exploring the many walking routes available across the area. On the other hand, a snowmobile safari will allow you to see the same stunning scenery without as much walking. Visit the Borosport Adventure Center in the Rila Hotel for more information about other activities in resort. 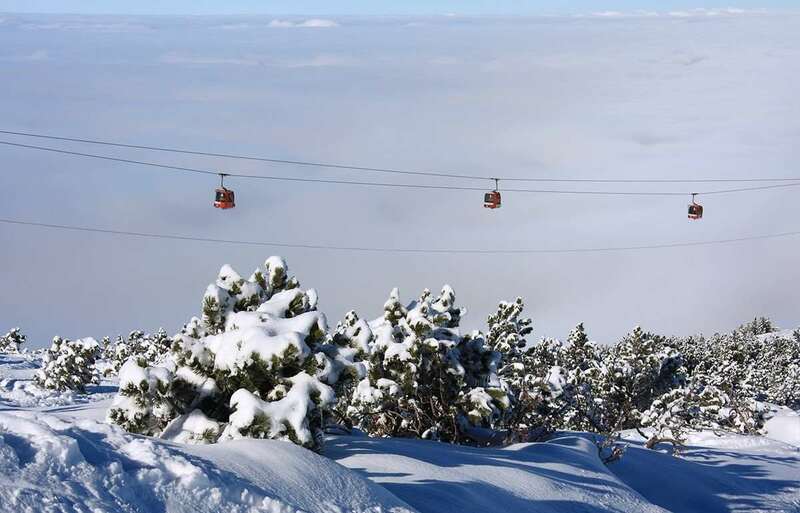 The closest airport to Borovets is Sofia, which is around 55 minutes away by car. Plovdiv is the next nearest and takes around two hours and 30 minutes.